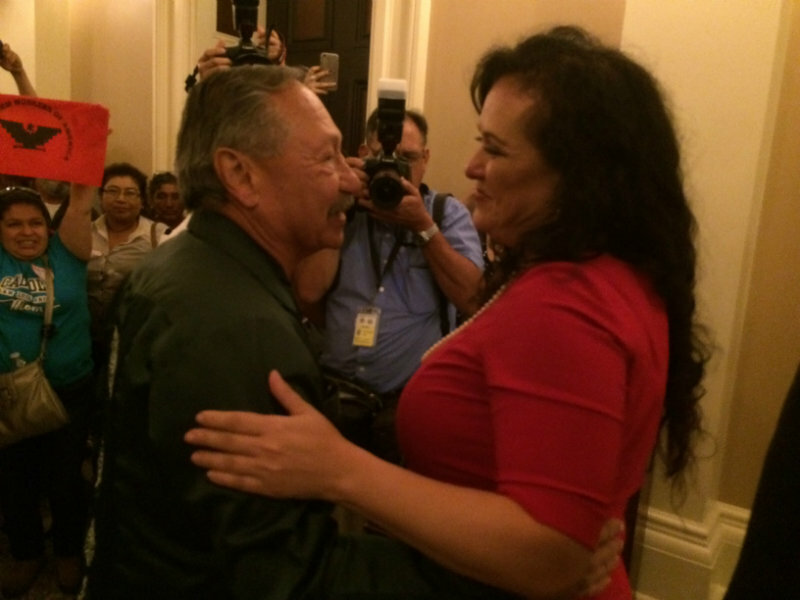 United Farm Workers President Arturo Rodriguez (left) embraces Asm. Lorena Gonzalez (D-San Diego) after the Assembly approved her AB 1066 on Monday, Aug. 29, 2016. Gov. Jerry Brown has signed a bill that allows California farm workers to earn overtime pay in the same way non-farm workers do. The measure drew fierce debate in the Legislature. All governors issue veto statements. But Brown has often chosen to release signing statements on particularly thorny bills, in which he explains his reasoning. The governor issued no such statement as he signed this bill, despite the strong feelings the measure has provoked among supporters and opponents. The measure passed the Legislature last month with only a handful of votes to spare. While Brown’s signature came without explanation, supporters and opponents aren’t mincing words in their reactions. On the other hand, the agriculture industry group Western Growers Association said that stores and restaurants will purchase produce from other states and countries because of California’s high operating costs, and that California farm workers will lose wages as a result. California will become the first state in the nation to require farmers to pay their workers overtime after eight hours a day or 40 hours a week. Currently, farm workers earn overtime after working 10 hours a day or 60 hours a week. The change will be phased in over four years starting in 2019. Farms with 25 or fewer employees will be given an additional three years to comply. A 2014 UC Davis study estimated there are 800,000 farm workers in California.